Born at Dartford, Kent, England on 28 October 1892, son of Arthur Wright Strapp and Jane “Jennie” Bailey, his family came to Canada in September 1911 and settled at Oshawa, Ontario. His father, a Methodist missionary in England since July 1887, preached at the Cape Croker Indian Reserve north of Wiarton, Ontario where Oliver was also a missionary in 1923. 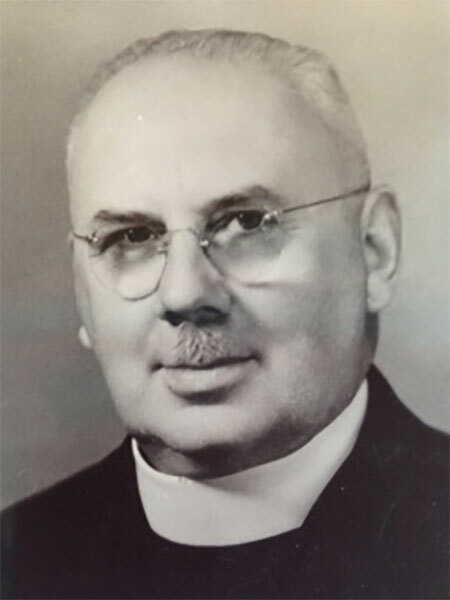 He attended the Wesleyan Theological College at McGill University and was ordained in June 1924 along with his brother Howard Wright Strapp (1896-1972). He was a missionary at Cape Croker from July 1924 to June 1927, and at Muncey Mount Elgin Residential School from July 1927 to June 1929. He was Assistant Principal at Muncey from July 1929 to June 1934, then Principal from July 1934 to June 1944. He was Principal at the Brandon Indian Residential School from July 1944 to June 1955. His last position was a Principalship at the Edmonton Indian Residential School from July 1955 to June 1961 at which time he retired. He was married twice, first to Marjory “Kathleen” Whicher (1894-1959) of Colpoy’s Bay, Bruce County, Ontario. They had no children. On 9 October 1967, he married Mary Eizabeth “Billie” Wiber (1897-1973) of Haileybury, Ontario. He died in October 1988 and is buried with his first wife in Edgehill Cemetery, Colpoy’s Bay, Bruce County, Ontario. A collection of photographs taken during his tenure at the Brandon Residential School is held at the S. J. McKee Archives. This page was prepared by Gayle Strank and Gordon Goldsborough.